A constant rain made the first stage of Crank The Shield extra challenging, but did not succeed in dampening rider’s spirits. Racers awoke to an absence of sunshine and sprinkling of rain, which grew to a consistent stream as the start of Stage 1 approached. Faced with a challenging 70 kilometers of hydro cut, gravel roads and singletrack, all 200 riders put on a brave face and ventured out into the Haliburton wilderness. In the end, the course received rave reviews from pros and recreational riders alike. The Scott-3Rox team of Kabush, Zandstra, Douglas and Jette were joined by Norco young gun L’Esperance to form the lead pack early on in the stage. In the end Kabush and Zandstra were able to work together to drop young L’Esperance with Zandstra edging out Kabush for the win. When asked about today’s conditions, Zandstra commented, “20 kilometers in we knew it was going to be a long day. It was Epic out there.” The Cyclery’s Tricia Spooner was able to edge out Cayley Brooks (Trek Canada) for the fastest female of the day. In the team categories, Andrew Watson and Hayley Smith (Norco Factory) took the mixed title and Jette and Douglas (Scott-3Rox) dominated the men’s tag team. Racers could not have tackled the day’s challenging course and conditions without huge support from the team at Motorex lubes keeping rider’s drivetrains running smooth at each aid stations. Shimano neutral service has been invaluable in getting racer’s ready for day 2, as has Norco Performance Bikes and their team of mechanics. Sunny skies and awesome singletrack put a smile on rider’s faces on the second day of Crank The Shield 2012. 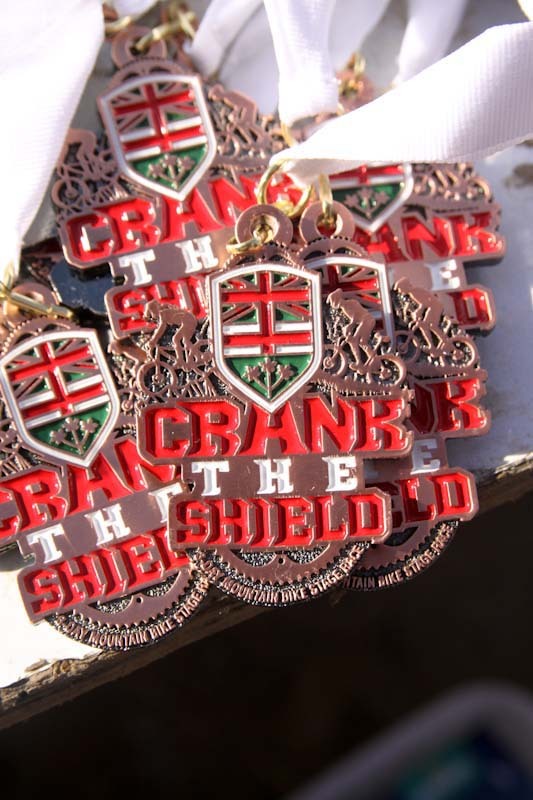 The second day of Crank The Shield saw riders complete a giant loop, starting and finishing just outside of their lodging at the luxurious Camp White Pine. In a stark contrast to the first stage, rider’s enjoyed the most singletrack laden stage of the race under sunny skies and warm temperatures. 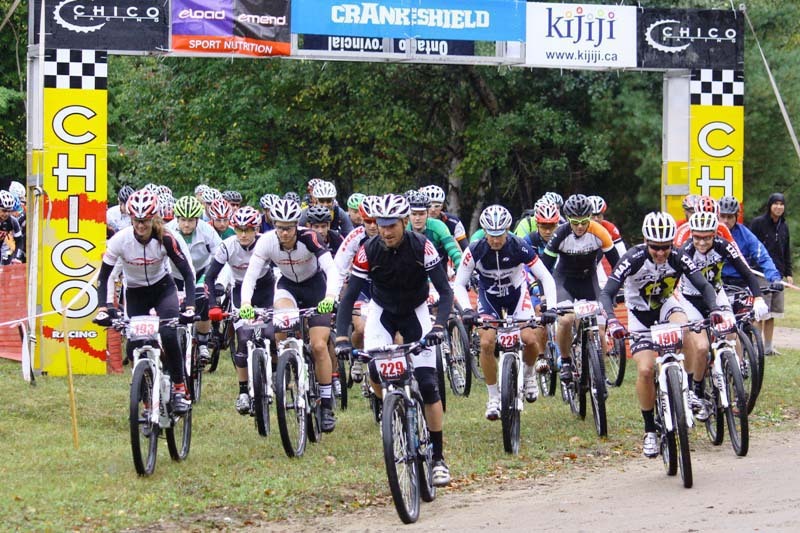 Featuring many of Haliburton’s best kept riding spots such as the Glebe and Wanakita Trails, the second stage was described by many as the best stage in the race’s four year history. Once again, it was the Scott-3Rox team controlling things at the front of the race with riders from both Trek Canada and Norco Factory also in the mix. Using team tactics to isolate solo challenger Andrew L’Esperance (Norco Factory), Kabush attacked early bringing with him the tag of Jette and Douglas and leaving Zandstra the task of controlling the powerful young L’Esperance. Not content to sit back and watch the race unfold, Zandstra used a passing car to his advantage and made a move to bridge up to the leaders, mistakenly taking L’Esperance with him. After several more attempts to drop the Norco rider and a flat by Douglas, Kabush and Zandstra were finally able to break free with Kabush crossing the line first overall. Cayley Brooks (Trek Canada) was the fastest solo female and the mixed team of Watson and Smith (Norco Factory) repeated their stage one victory. After a fifteen kilometer neutral ride, the final stage of the race will begin Sunday at Sir Sam’s Ski and Bike. Known for its amazing singletrack and breathtaking views of Haliburton Forest, riders will finish the race with some of the best singletrack in the area. Tired legs will take solace in the shortest stage of the race and will be greeted at the finish in Haliburton Forest by their families and a huge feast fit for Kings and Queens. The final day of Crank The Shield 2012 could not have been any better as riders were treated to ideal weather and epic amounts of singletrack. After a short ten kilometer neutral ride from Camp White Pine over to Sir Sam’s Ski and Bike, riders were greeted with snacks and warm drinks before starting their final day of racing. 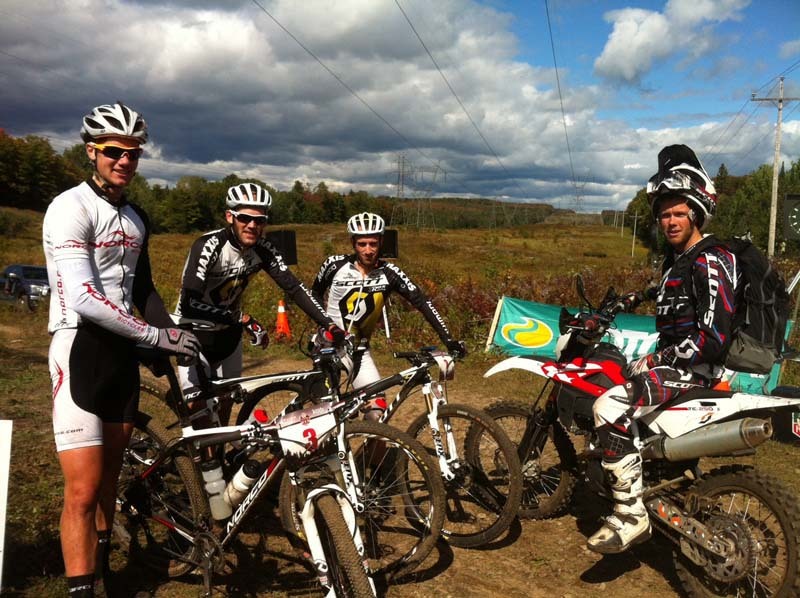 The riders climbed the ski hill twice while sampling the amazing trails at Sir Sam’s. Next it was off to Haliburton Forest via gravel roads and hydro cut where once there they rode the extremely challenging and root laden trails, such as the famous Normac Trail. Upon finishing at the Forest Centre, riders were treated to an amazing chicken and ribs barbeque. Andrew L’Esperance (Norco Factory) attacked early in the stage getting a substantial gap on the powerful Scott-3Rox. “I just knew I had to try something early and see if I could stay away. Anything can happen in stage racing and you can’t give up”, said L’Esperance. Not long past the half way point Kabush and Zandstra were able to pull back the gap, but it was the Norco rider who crossed the finish line first taking his first stage win at Crank in 2012. Ultimately, there were no major GC shake ups with Jette and Douglas (Scott-3Rox) taking the overall tag team title, Watson and Smith (Norco Factory) taking the mixed team title, and Cayley Brooks (Trek Canada) the top solo women’s crown. An event of this magnitude cannot happen without the support of many in the cycling community. Chico Racing would like to extend a giant thank you to the crew at Norco Performance Bikes and Shimano Canada for providing neutral support to all the racers. Motorex lubes were essential in keeping their bikes running smooth. Haliburton Forest and Sir Sam’s were amazing hosts and of course, Camp White Pine exceeded everyone’s expectations with comfortable cabin and amazing food!